An event almost passed through my twitter feed without me noticing last week but luckily it didn’t completely pass me by. The evening was hosted by “Vancouver’s most passionate wine bloggers & sommeliers” and was seemingly aimed at educating people as to some of the subtleties of wine. This group was newly formed and featured a mission statement on the front of the evenings program. 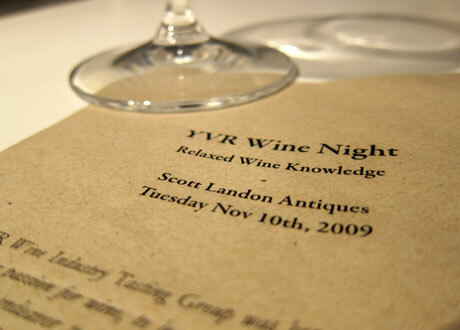 YVR Wine Industry Tasting group was born out of a desire to share our passion for wine, to lean more about it, to connect with others. We endeavor to give back – by sharing this passion and knowledge outside of industry circles…and hope that you will come away from this evening with a mind that is more open to possibilities, and with a new appreciation for the inexhaustible beauty and pleasure of wine. The event was hosted at Scott Landon Antiques store which provided a warm and intimate environment to sample some wine. 10 tasting stations were interspersed with old antique and each station had a theme with two wines selected to help demonstrate that particular theme. What affect does climate have on wine? How many different grape varietals can you name? Does Argentinian Malbec taste like Malbec? When was the last time that you served a sherry? Can you describe what a Riesling tastes like? Will a glass Bubbly this festive season be your first this year? Do you think artisan wines are worth the money? Do you prefer Molson or Kokanee? The room was pretty crammed with a lot of people and could have used with some more space, and 2-3 more tables to space everything out a bit. Talking around, everyone enjoyed different stations, but seemed to enjoy ones where the was opportunity to converse and ask questions without being surrounded by 8 other people looking for another pour. The stations were well balanced with red, white, champagne, sherry and beer. The beer jumped out as the one station that was out of place. The beers that were poured (Orval Trappist Ale, and Dogfish Head 90 min IPA) were both good, but didn’t have an over all theme or lesson. My favourite stations were the Riesling, Champagne and Malbec each for different reasons. The Malbec stations talked about the historical differences between French and Argentinean Malbec while the Riesling compared Germany and Austrian that illustrated some of the tastes differences between them. At the champagne station I ended up having a long and off topic chat about grape differences and wine production. The wine of the night was tie between the Elkhorn Peak 2000 PInot Noir (Napa Valley, USA) and the Jakoby-Mathy Riesling Kabinett (1999 Mosel, Germany). All of the wines that were poured are currently available form Kitsilano Wine Cellar and I’ll be making a trip down there soon to pick a few up! Looking forward to more events like this. No website for this group yet, but follow organizer Jeff Bashford (@vinaroon) to stay in touch. Sorry to have missed this – it sounds like it was a good time. Did your palate make it through all 10 tasting stations? I find that the hardest part. I was more worried about ME making it through all 10 stations. I’m sure that my pallet was a little lost by the end, but even the last few stations made an impact with regards to some, admittedly large, differences in tastes. Nice Review Steve, and thanks for attending. I love that you were into that Jakoby Riesling – it’s 10 years old and under $30! So good! As always, love the feedback and we hope to make the next event even better. Oops! Looks like there’s a typo in the title to this article. I think it should be “YVR” not “VYR”. Thanks for the good catch Joseph. All corrected now! Great post. loads of good points which I assure you have been noted. Hopefully we can keep growing and improving the tastings. I really appreciate you coming out for the event and look forward to having another glass with you soon.